We are Jason and Melody, and this is our family - Evan, Rowan, Calvin and Scarlett. Jason and I were both born in this area and have called Guelph and Wellington County our home for almost 38 years now! In 2012 life was moving at full speed and quickly got even busier when we were surprised to welcome our fourth child, a beautiful little girl…Scarlett into the family. Great memories were being made and active bundles of energy were bouncing around the house. At first, doctors thought Scarlett had Autism. After a year of additional testing, the result came in: Rett Syndrome. Imagine the symptoms of AUTISM, CEREBRAL PALSY, PARKINSON’S, EPILEPSY and ANXIETY DISORDER… all in one child. That is Rett Syndrome. Rett Syndrome is a rare and serious lifelong neurological disorder that is caused by random mutations in a gene called MECP2. Diagnosed almost exclusively in girls, symptoms typically appear in toddlerhood. Many children with Rett are unable to speak, walk or use their hands. Breathing problems, feeding tubes, seizures, anxiety, gastrointestinal and orthopedic issues are common. When children who have Rett are born there are no signs to show. Scarlett was born “normal”, healthy and full term. She developed typically until a year and a half where she seemed only slightly behind her peers. She could say a small handful of words: pig, purple, and momma were some of them. This is how Rett presents itself: development is normal until about 6 months to eighteen months of age when development slows or stagnates. What follows is a phase of regression. During Scarlett’s regression, we did not know at the time she was regressing. It was very slow and incremental that it was hard to notice with a busy house of four kids. She used to be able to crawl up and down the stairs, feed herself independently and use her hands to play or flip pages of a book. Regression phase stole all that from her. After regression hits which can take anywhere from a few weeks up to a year, the child hits a plateau phase where they stop losing skills and can learn and grow, yet never back to what they could do beforehand. Rett affects every 1 in 10,000 girls. It is primarily a female neurological condition as males may have it but many die by the time they are two years old. This was a tough pill to swallow for us and we spent time grieving the losses our child faced, yet we have also seen miracles along the way. Scarlett was diagnosed with Rett on September 4, 2015. Our world has not been the same since then. By Christmas of that year you can understand, I’m sure, I was depressed and discouraged. As a “dare” to myself I prayed and asked God for a year of breakthrough and boy did He deliver! Enter the Guelph Wish Fund for Children. On a wintry morning towards the end of January 2015 I met with another parent of a child with special needs who had started using Eye Gaze technology to communicate. I sat in a Tim Hortons in Guelph and used my eyes to play a little computer game. I saw the potential for Scarlett to be able to use it to communicate, came home and told my husband, “we need one of these Tobii’s”. Two days later I get a phone call from the Guelph Wish Fund for Children. Someone had referred our names. The Executive Director wanted to meet with us to see if they could come alongside and help. It was exactly what we needed to go ahead and purchase an entry level Eye Gaze system. The price tag was nearly $5,000 and this started Scarlett on her journey to being able to communicate. 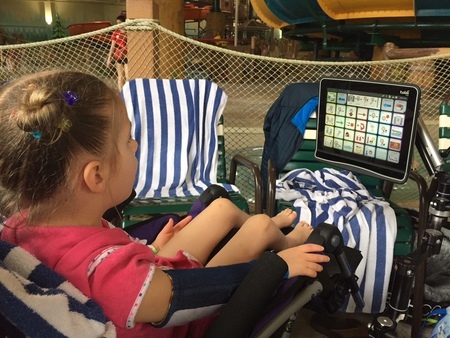 From the first moment Scarlett was able to use Tobii, it became evident that she understands what we’re saying and doing. I’ll never forget a special moment at the dinner table that occurred after only a month of using the Tobii. She independently selected her brother Evan’s name and began to navigate to a different page on her device and said, “I love you”. She then proceeded to say, “Calvin - I love you”. By the time she got to saying it to her sister, she simply looked at Rowan and nodded her head as if to say “yeah, you too”. The concentration she needs to make selections gets tiring on her eyes. Being able to communicate, Scarlett can go to school, can learn to read and count just like other kids her age. Currently she’s enrolled in our local public school. She gets many invites to birthday parties and is a valued member of her class. Without the ability to even simply signal yes or no, she would be locked away in a body that does not cooperate with her wishes. This is all thanks to the generosity of the Guelph Wish Fund for Children. It was the answer to my prayers during that challenging time in our lives. The impact on the life of Scarlett and the life of our whole family has been priceless. We were also able to use the funds to take our family to Great Wolf Lodge this past winter, the Aquarium in Toronto this summer as well as iFly and a few other fun activities to enjoy as a family. Raising a family with four children is not cheap, especially a family with a child with special needs. If we had waited for government services to come and provide us with the Tobii, Scarlett would have been waiting for a minimum of two-years, plus all the appointments and assessments necessary to get approved for it. Being able to simply place an order because we had the funds from the Guelph Wish Fund, made a world of difference and we are eternally grateful. From the bottom of our hearts we sincerely say THANK YOU!